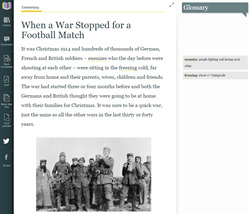 This post is taken from our Elementary graded reader about the famous 1914 Christmas truce that took place during the First World War. A war which was known at the time as the War to End All Wars. Of course it did no such thing and in fact sowed the seeds of a number of subsequent deadly conflicts. This story though is about ordinary soldiers playing football instead of shooting at each other. It was Christmas 1914 and hundreds of thousands of German, French and British soldiers – enemies who the day before were shooting at each other – were sitting in the freezing cold, far away from home and their parents, wives, children and friends. The war had started three or four months before and both the Germans and British thought they were going to be at home with their families for Christmas. It was sure to be a quick war, just the same as all the other wars in the last thirty or forty years. Now, the same soldiers were sitting looking at each other in Belgium, a country that had never joined the war. But Germany attacked it so that its soldiers could walk into France without much fighting. These young men understood now that they were not going anywhere very fast. There were a million of them in the cold fields of Belgium and it was impossible for the Germans or the British to move very far. Thousands were dying every day. They all had friends that were talking to them one minute and were dead seconds later. Young men, just boys really. On 24th December, 1914, German soldiers put candles on Christmas trees and began singing songs. The British did the same. Then these young enemies started shouting to each other across no man’s land. They shouted ‘Happy Christmas’. Slowly, the soldiers stopped hiding and stood up. They walked into the land between the German and British sides. A few were killed, but most met and talked, drank together and shared food. One man wrote that he saw a British machine gunner giving a haircut to a German soldier. Many soldiers took photographs. In some places, the fighting started again on 26th December after Christmas was finished but, in other parts of the country, the soldiers did not begin shooting again until after New Year. And, of course, the Germans and the British played football, the game they both knew and loved. Of course, some people did not like this end to the fighting. They moved the soldiers to different places where they were not shooting at people they were playing football with a few days before. Others thought that British and German soldiers should never be friendly with their enemies. Adolf Hitler was one of them. But that did not stop 100,000 enemy soldiers from stopping fighting and playing football that one Christmas in 1914. Read Listen Learn provides easy access to an online library of affordable, fully illustrated digital EFL, ESL and ESOL graded readers. We help people learn English through reading and listening for pleasure.